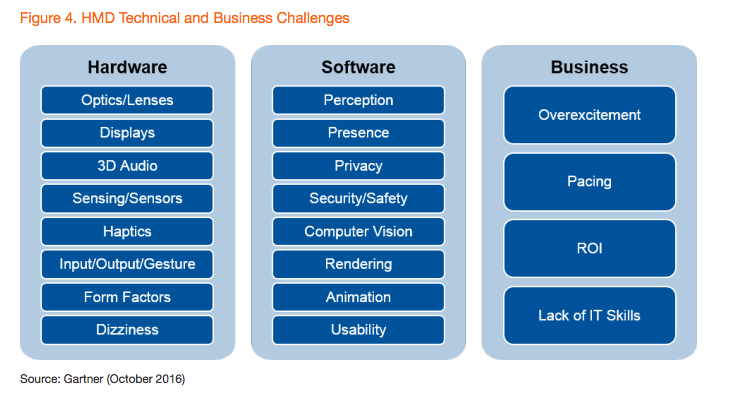 Committees seek to establish best practices, guidelines and call-to-actions to further accelerate the VR/AR market. NEW YORK, Dec. 11, 2016, - The VR/AR Association (VRARA) is soliciting participation in Industry Committees for Virtual Reality (VR) and Augmented Reality (AR). The committees will work with members and the industry at large to create best practices, guidelines and call to actions for VR/AR verticals. VRARA is the global industry association for VR, AR and MR, connecting leading solution providers with brands and customers. Members and sponsors include Aisle411, Amplified Robot, ArchiactVR, AT&T, EON Reality, Locus Labs, Finger Food Studios, Mativision, NYU, Orange, Touchstone Research, Trick3D, Samsung, USA TODAY NETWORK, Walgreens and other VR/AR hardware, software, and content companies. Digital Health - Join representatives from Meta Co, Mativision, Rafael J. Grossmann, MD, FACS, Shafi Ahmed PhD FRCS, John Nosta and other experts from the industry to work on VR/AR as it relates to medical, healthcare, and education. Experiences, Story Telling and Audiences - Join representatives from USA TODAY NETWORK, A+E Networks, and other leaders to work on a common goal: how to grow the audience for VR. VR Content Licensing - Join Mark Caplan, recent SVP Global Consumer Products at Sony Pictures Entertainment whom was part of the executive team that established the VR initiative and planning for the company and who served as a West Coast VP of the (LIMA) Licensing Industry Merchandisers’ Association and other experts to help companies navigate in the entertainment space, e.g., digital, content owners, theme parks, merchandise, VR/AR, mobile game companies, to get a better understanding on the movie, TV, comic, and other IP for use in product. Advertising - Join the 4A’s (American Association of Advertising Agencies), which represents U.S. advertising agencies and other leaders in defining what advertising should or should not be in VR/AR. Co-Located - Join representatives from NYU's Motion Capture Lab and other leaders to expand the palette of creative and technical tools for makers in the VR space, engage in discussions around UX and implementation, and build a strong network of practitioners. Retail & eCommerce - Join representatives from Aisle411 and other industry leaders testing new forms of AR and VR used in-store and out-of-store to enhance and analyze purchase behavior. Other committees include Public Safety & Emergency Response, Education, Mobile VR, among others. 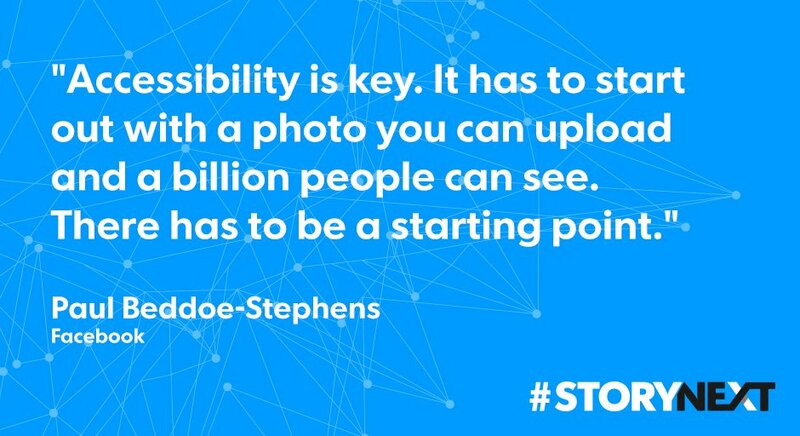 It's about Story (Content) Creation and "Advertising"
In this post, I talk about how Snap will use the technology to become one of the world's biggest online media and advertising companies, competing with the likes of YouTube. Already users of Snapchat are reportedly viewing at least 10 billion videos per day. And in my previous post, I shared examples of how Snap users are now posting 10 times more with using the Spectacles. Snap's new motto is "improve the way people live and communicate," i.e., with the camera. This has everyday connotation. Unlike other smartglasses and AR solutions, Snap Spectacles are about everyday use, by anyone. It's not about a specific use case or vertical, it's about everyday day life. It's about first person's narratives (watch video below.) This can have the potential of translating Snap's image recognition triggered ads into a huge business. You probably heard this year Alibaba topped $18B in sales in one day during the world’s biggest shopping day on its Tmall ecommerce platform. In comparison, combined Black Friday and Cyber Monday sales in the US in 2015 were about $14B, and that’s across all retailers. This year on Tmall, brands & retailers got to experiment with new commerce concepts, such as VR. Shoppers got to experience shopping at Macy’s and other virtual stores and were able to discover and engage with items as if they were in the real store, including purchase by way of controlling their gaze. Alibaba integrated with Alipay to allow customers to check out with Buy+ within the VR environment. VRARA member VRCommerce, has built a VR ecommerce platform that integrates with the retailer's existing product catalogs. “We’ve created a seamless path for retailers to begin to experiment in VR and create incredibly immersive transformative retail experiences,” says VRCommerce CEO, Amol Sharma. The video clip showcases a few of the early virtual storefronts. The user experience and UX can be completely tailored to reflect a brand and the experience desired. Example #1 shows an experience that could be inside an Apple, Samsung, AT&T or Verizon stores. Example #2 shows an interactive 360 experience inside a furniture store. Example #3 shows VR shopping inside a store like Macy's or Target. In October, Alibaba started selling 150,000 cardboard VR headsets for 1 yuan (about $0.15). This enabled 8M shoppers to try out VR shopping experiences with brands like Costco, Macy’s, Procter & Gamble, and Target. Other brands, including Target, CostCo, and Tokyo Otaku Mode, are also doing virtual shopping experiences with Alibaba. Alibaba claims this gives consumers a chance to more deeply engage with the product, to understand it better, and to do it in a famous’ store environment, saying, “it is a new tool to move the relationship with their consumers beyond a highly transactional one where speed and efficiency count most, and allow the brand to create stronger bond" (Mike Evans, Alibaba’s President). In offline B&M retail, Alibaba created a Pokémon-Go-like augmented reality mobile game — “Catch The Tmall Cat” — to drive traffic to the offline stores of partner retailers like Starbucks and Suning and increase sales; players could “capture” discount codes to use in stores. Come meet VRARA, VRCommerce, and other VRARA members at the NRF Retail Show in NYC in Jan. More info here. The industry needs a success story for consumer smartglasses and AR that goes beyond PokemanGo. Here's why you should pay attention to Snap as an Augmented Reality player with respect to hardware, software, and content. You probably know Snapchat (it launched in 2011 and changed it's name to "Snap Inc" in 2016) as the popular mobile messaging app that allows you to send videos and pictures, both of which will self destruct after a few seconds of a person viewing them. You can capture a photo or brief video with it, then add a filter (lens) over it, and send the finished creation (called a snap) to a friend. Alternatively, you can add your snap to your "story", a 24-hour collection of all your snaps that’s broadcasted to the world or just your followers. Filters are a fun overlay; an augmentation of reality. You can even add geo-filters to your snaps. What most people (still) don't realize, that Snap's filters have evolved into Augmented Reality filters. In fact, Snap might be the world's biggest AR company right now (yes, bigger than PokemanGo). Moreover, Snap is working on ad products, Snap Ads, which are Vertical Videos, Viewed by Choice; and Unlockables, which include Sponsored Geofilters, Lenses, and other unique (i.e., AR objects) ad products. The background is that Snap has acquired 3D photo app maker Seene (also known as Obvious Engineering). Seene lets you capture 3D models from your phone with a simple smartphone camera. Snap uses Seene’s format for a brand new category of selfie lenses and augmented reality projects. Seene scans and reconstructs full 3D geometry on your phone. Unlike Google's Project Tango or Microsoft’s Kinect, Seene doesn’t need special infrared sensors and multiple cameras. Similarly, Seene doesn’t need a cloud backend to process 3D scans and recreate 3D objects, everything happens on the phone. Watch the video "Scan yourself into virtual worlds with Seene" to learn more. In addition, Snap has acquired a company that makes smartglasses in 2014; Vergence Labs made Epiphany Eyewear, a range of fashionable black-framed smart glasses that allow wearers to record video at the touch of a button. Also, Snap has acquired video software company AddLive, to advance its video functionality. All these acquisitions have came to fruition into a successful product, the Spectacles, the smartglasses with a video camera, which are becoming a smash hit. I experienced the Spectacles-mania phenomenon this past week, when I was standing in this line (see the video "Snapchat Spectacles Bot Drop") to purchase the Spectales. I recorded an existing user that demo'ed the Spectacles to us. The highlight was when he said "I don't have to use my phone anymore to Snap." He also said that he "snaps" 80 times per day with the Spectacles, compared to 5 times a day before he got the Spectacles. What what also fascinating was the fact that he works for a security company, given the security (and privacy) questions arising around the Spectacles-mania. 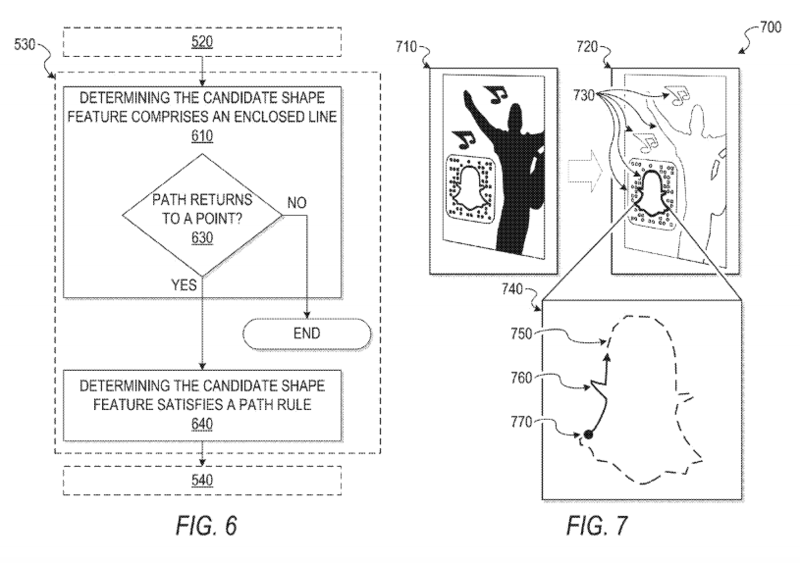 Furthermore, Snap Inc has been granted several patents related to AR and optical objects, including the below patent United States Patent Application: 0160210545 (CUSTOM FUNCTIONAL PATTERNS FOR OPTICAL BARCODES) for mobile and wearable devices that will leverage Snap QR codes for the device to scan the object and trigger relevant content. This can be related to Snap's ad products, Snap Ads, which can be in the form of Vertical Videos, Viewed by Choice; and Unlockables, which include Sponsored Geofilters, Lenses, and other unique (i.e., AR objects) ad products. On November 16, 2016, the following U.S. Senate Committee Hearings on Augmented Reality took place. U.S. Sen. John Thune (R-S.D. ), chairman of the Senate Committee on Commerce, Science, and Transportation convened the hearing, entitled “Exploring Augmented Reality.” The hearing examined the emergence, benefits, and implications of augmented reality technologies. Unlike virtual reality that creates a wholly simulated reality, augmented reality attempts to superimpose images and visual data on the physical world in an intuitive way. Good afternoon. I would like to thank everyone for coming today to discuss the exciting potential of augmented reality technology. This past Fourth of July weekend, many Americans began to notice an unusual phenomenon: more and more people – far more than usual – were going outside. Suddenly, sidewalks, parks, and local landmarks were packed with people wandering the great outdoors while burying their heads in their smartphones. These people, of course, were playing the smash hit mobile game Pokémon GO. But by going out into the real world to find and capture digital creatures, they weren’t just playing a game – they were getting their first exposure to the possibilities of augmented reality. Many of us have heard of, or experienced, virtual reality, which usually involves putting on a headset that covers users’ eyes, surrounding them in an artificial world. 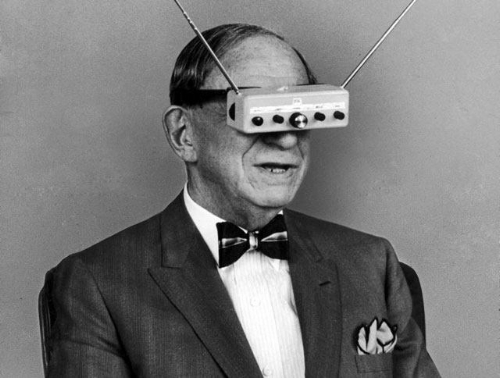 Augmented reality, or AR, is different. AR takes digital information and superimposes it onto the real, physical environment. Rather than closing the user off from the real world, AR adds virtual content on top of the real world. Pokémon GO accomplishes this by using a smartphone’s camera to record the real world while the game displays digital characters over the image on the phone’s screen. More advanced AR headsets currently in development and in use by industry have “mixed reality” capabilities that can map the user’s surroundings in real time and allow virtual content to convincingly interact with the physical world. These more advanced AR devices and techniques show that the potential of this technology goes far beyond smartphone games, and could one day have a major impact on manufacturing, transportation, medicine, and eventually the daily lives of average Americans. For example, imagine a worker in a factory whose job is to assemble an advanced jet engine for a new airliner. 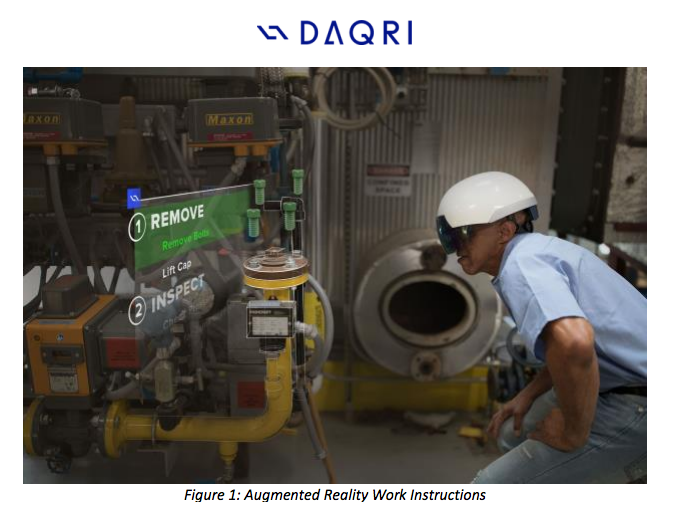 With an AR headset, that worker could see step-by-step instructions floating above his workstation, with the exact spot he is supposed to weld being digitally highlighted. Or imagine a medical student who can train on a virtual 3D model created from scans of a real patient. Or an EMT in a rural area who can receive real-time instructions from a specialist in a hospital hundreds of miles away on how best to stabilize a patient while help is on the way. AR technology promises to take all of the information that has been confined to the Internet over the past few decades and integrate it into the physical world, where such content can be most useful and do the most good. Advanced manufacturing and other industries have already begun using AR for training new workers and have seen great improvements in safety and efficiency. We often hear about technology replacing workers, but AR provides an opportunity for technology to enhance workers instead, by helping them with their training and making them more productive. In previous hearings this Committee has held on new and emerging technologies, such as the Internet of Things and Autonomous Vehicles, I stressed how important it is for government to avoid jumping in too soon with a heavy-handed regulatory approach. AR is no different. While there are certainly important policy questions to consider, such as the privacy of user data recorded by AR devices, it is essential that policymakers not unnecessarily stifle innovation. Instead, we should foster an environment that maximizes the potential benefits of this promising new technology. Earlier today, the Committee had the great opportunity to see AR in action first-hand. DAQRI, Niantic, and the U.S. Army Edgewood Chemical Biological Center provided us with a great demonstration of: the DAQRI Smart Helmet and a heads-up display for automobiles, which gives drivers important information without having to take their eyes off the road; Pokémon GO and other Niantic apps; and military-focused applications of AR. Even though the only reality they could augment was the reality of the Russell building, it was easy to see the potential of this new technology for a wide range of applications. I want to thank them for making their products available to us today. I look forward to hearing from all of our witnesses to learn more about their experiences with AR and their visions for the future of this promising new technology. 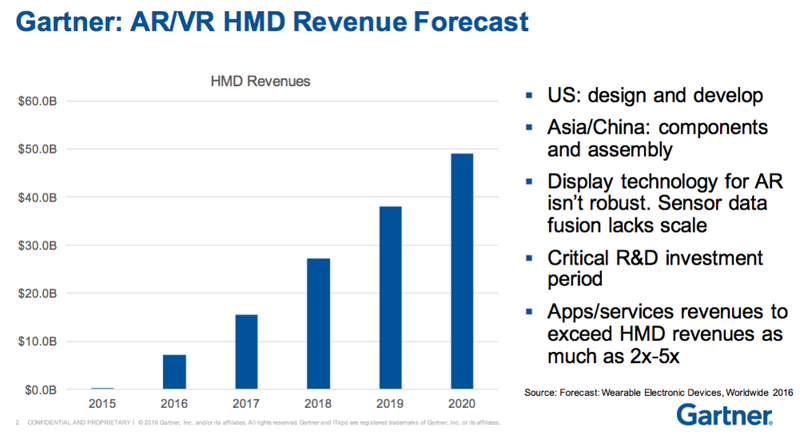 The VR/AR Association's Kris Kolo was interviewed for this Business Insider article. Apple is integrating augmented reality technology into the iPhone’s camera app. The effort, which involves teams from several acquired startups, reflects Apple’s near-term desire to put augmented reality technology into consumers' hands even as it develops special glasses that could eventually change the way people perceive their surroundings. Augmented reality is an exploding field in technology in which digital objects are superimposed onto the real world. A view of a city street for instance can be enriched with a map for directions, a coupon for a nearby store or an animated character in a video game. The ultimate goal is a pair of smart glasses, and companies including Google, Microsoft,Facebook, Apple and Snapchat are all actively developing or exploring such a product. But in the near-term most popular augmented reality applications will take place on a smartphone, as was the case with this summer’s smash hit Pokemon Go app. By adding AR technology into the iPhone’s camera software, Apple wants consumers to be able to point the phone at a real-world object and have it be recognized, according to Kris Kolo, director of the VR/AR Association and a board member of Flyby Media, an AR startup that was acquired by Apple earlier this year. That would require creating or licensing a database of 3D objects. Another early feature for Apple's AR integration into the camera app could be to recognize and manipulate people's faces. Apple integrated facial recognition technology into the photos app in the most recent version of its iOS software, and purchased FaceShift, a company with similar technology in 2015. Apple has acquired several AR and virtual reality technology companies in recent years including Metaio, in February 2014 and Flyby Media in January 2016. The employees from both groups are now working in Apple’s camera group. Eventually, Kolo said, after the AR features are built into the iPhone camera app, Apple will release the technology behind them as an SDK for app developers, like it did with its Touch ID fingerprint sensor. 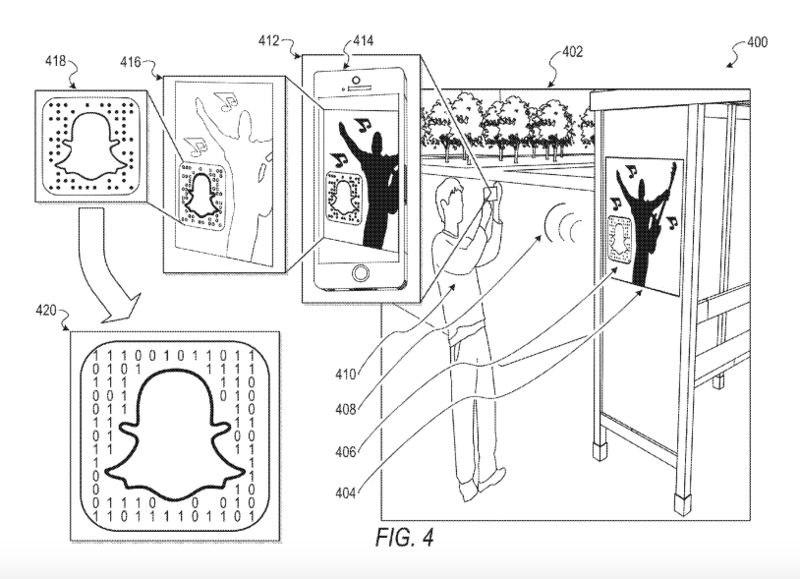 At that point, Apple will become a competitor to companies like Vuforia and Blippar. Several leaders in the augmented reality space have previously said they expect Apple to integrate AR into the next version of iOS. Apple is also working on a pair of skinny, stylish smart glasses that pairs to an iPhone to display contextual information, Bloomberg reported on Mondayand sources have told Business Insider. However, the timeline for the device is far into the future — 2018 or later, according to the Bloomberg report. But there are some signs that the project has moved out of the exploration labs and into a more advanced stage in which Apple is exploring production. John Border, who lists his title as "senior optics manufacturing exploration engineer," joined Apple in September, according to his LinkedIn profile. Border's bio describes him as a "subject matter expert in the fields of head-worn displays, plastic optics manufacturing, camera systems and image sensors." ODG is notable as one of the few companies currently demoing a fully functional pair of smart glasses. ODG sells a device called the R-7 Smartglasses that uses "3D stereoscopic ultra-transparent see-thru HD displays" to superimpose computer graphics into the real world. 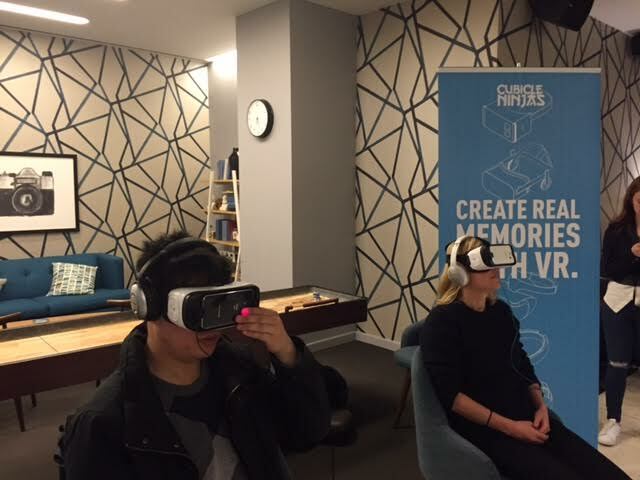 The VR/AR Association partnered with USA TODAY NETWORK for this event in NYC that attracted the best minds in Media, Publishing, Journalism, and VR from the likes of USA TODAY NETWORK, Facebook, Google, New York Times, United Nations, among others. Below is a video of the USA TODAY NETWORK team talking about their VR app, VRTUALLY THERE, and their experiences. The discussions were of course around VR Stories, and specifics included content creation and consumption by anyone, viewed on any headset. Right now, you can't watch Facebook 360 video on Google's headsets, nor vice versa, can't watch Google's YouTube's 360 videos on Facebook. Where is the interoperability, compatibility the crowd asked. You can read more about what USA TODAY NETWORK is doing in VR here. Now a member of the VRARA, the NETWORK is further committed to engaging the VR community. The USA TODAY NETWORK has proudly joined the VR/AR Association (The VRARA) as part of the organization’s long-term commitment to build a deeper connection and further engage with the VR and AR community. The VR/AR Association is an international organization designed to foster collaboration between innovative companies and people in the virtual reality and augmented reality ecosystem that accelerates growth, fosters research and education, helps develop industry standards, connects member organizations and promotes the services of member companies. “The VR/AR Association is excited to welcome the USA TODAY NETWORK as a member. Both of our organizations are dedicated to accelerating the growth in the virtual reality and augmented reality industry. As a member, the USA TODAY NETWORK will participate in the Association's initiatives and together with the community will accelerate the development and consumption of VR content." says Kris Kolo, President, VR/AR Association, NYC. Being one of the first major publishers to experiment with storytelling using virtual reality, the NETWORK has been at the forefront of innovation when it comes to marrying technology with premium journalism, and has made major strides in producing award-winning VR content both editorially and for brands. Learn more about USA TODAY NETWORK products, projects, and initiatives related to VR here. 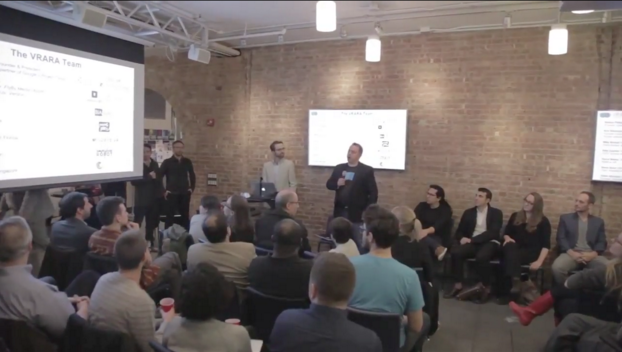 Tuesday’s event at the NYU Data Future Lab was another great success for the New York chapter of the VR/AR Association. The night began with esteemed media consultant and start-up veteran Chris Pfaff of Chris Pfaff Media/Tech LLC giving a primer on augmented reality, as well as the various channels through which it is presently operating and through which it is anticipated to operate. Naturally, Niantic’s Pokémon Go was a point of discussion; the breakout mobile game’s AR capability has been and continues to be debated amongst developers and academics. The debate itself is testament to the embryonic state of AR in the present age. It is for this reason that Pfaff’s basic definition of the technology — the layering of digital sensory information over reality — was both appropriate and necessary. Blippar's Ariff Quli operated under the same premise of “technological infancy”. Through his presentation, the notion of “everything around us [being] a new channel” was truly realized. A live on-site demo showed attendees the capabilities of machine learning not only for commercial spheres such as marketing and retail, but for education as well. From the anthropomorphization of a Coke bottle and the simulated exploration of the inside of a Jaguar XJR to the flight of virtual butterfly, born from the margins of a 2D drawing. As advanced as the beta was, future iterations will only become more developed, more accessible, smarter. That is to say, the future of visualization through AR, in industry and education, is promising. This was reaffirmed by Diego Florentin of Squadability, whose insistence on AR’s potential beyond entertainment and advertising was particularly emotive. As might be expected, he touched on the Internet of Things and how our everyday lives will be suffused with AR technology. For instance, the implementation of AR technology for the sake of affecting change toward the minutiae of our activities, our sports, our fashion, even our transportation systems. Imagine the ability to drive and not only hyper-visualize the things that lie before you and your immediate area but to also preemptively organize and navigate any route, all without having to look away from the road and down at your phone. Florentin ended his presentation with a call to action, to think bigger and to disrupt. Oskari “Ozz” Häkkinen of Futurefly directed us toward the more gaming-oriented path that lies in AR’s future. However, he also introduced us the recently launched RAWR, a messenger app operating through the interaction of personalized 3D avatars that are responsive to a myriad of terms and emojis, denoting the weather, setting, and even physiology of the avatars themselves. Particularly interesting is that the avatars do not stay confined to the tiny world within the messenger app but can be superimposed onto our own rooms and surroundings. The night continued with Ixonos’ Ted Iannuzi, whose technological endeavors predate the commercial implementation of VR and AR, but not necessarily their conception. Iannuzi’s talk began with the literature and ideas within that literature that inspired him — Popular Science, Popular Mechanisms, science fiction comics. He presented a pre-Internet world, imagination as the driving force behind emergent technologies, whose linear history trace back from TV Googles in 1963 to a holographic ATM that transcends physicality. And with the remembrance of a pre-Internet world came the contemplation of a post-Internet one. Our Q&A session brought forth a important question concerning the standardization of AR technology, of a forthcoming reality that is increasingly softening borders that once stood so resolute between the physical and the virtual. What to call this new term of art and design, of new forms of engagement? “Sensorama…” quipped Iannuzi. 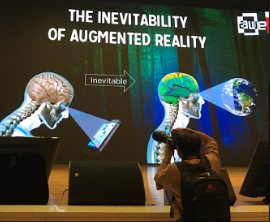 The Augmented World Expo (AWE) is the largest show for AR. Kris Kolo was invited to speak at the event and establish relationships with China and Chinese companies. There are over 1000 companies in Asia doing AR, VR, smartglasses, etc. This event was a sample of that. 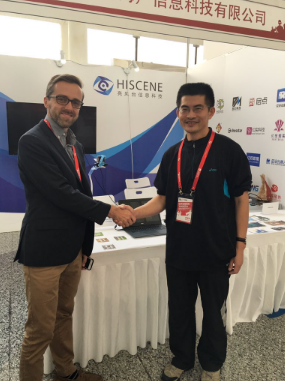 I was really impressed with next-generation HDM's with gaze-activated object recognition with stereoscopic optics, IR LED, EOG Electrodes for wink detection, OR processor, AR 3D shapes, etc. Talk about an "eye mouse" and next-gen interfaces using your eyes! While at the show Snapchat or Snap made an announcement in the US about their Spectacles. There is a lot of tech in Asia that can make anyone's sunglasses smart. Contact kris@thevrara.com for more info! Thank you to the event sponsors BrickVR and SpaceoutVR! 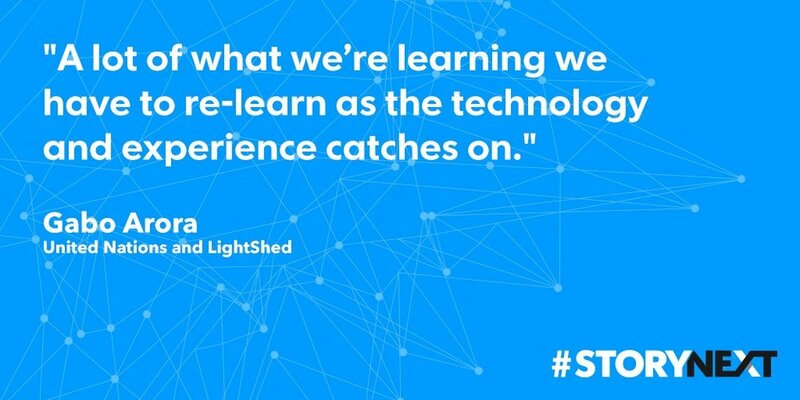 ‘Awesome,’... followed by smiling and laughter, as the attendee was immersed via the VR headset into another world. 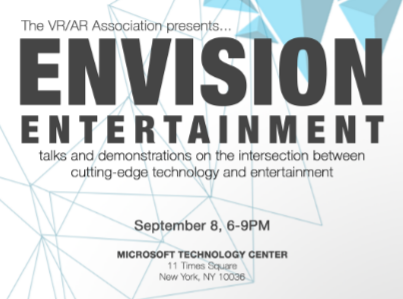 Excitement was the sentiment expressed by people who came and participated in our Envision Entertainment VR/ AR Event at Microsoft Technology Center last night. As an introduction to the brands and agencies that need more content in VR and AR; our goal was to start the conversation on how to integrate more VR/ AR experiences into production, marketing planning, and budgets. 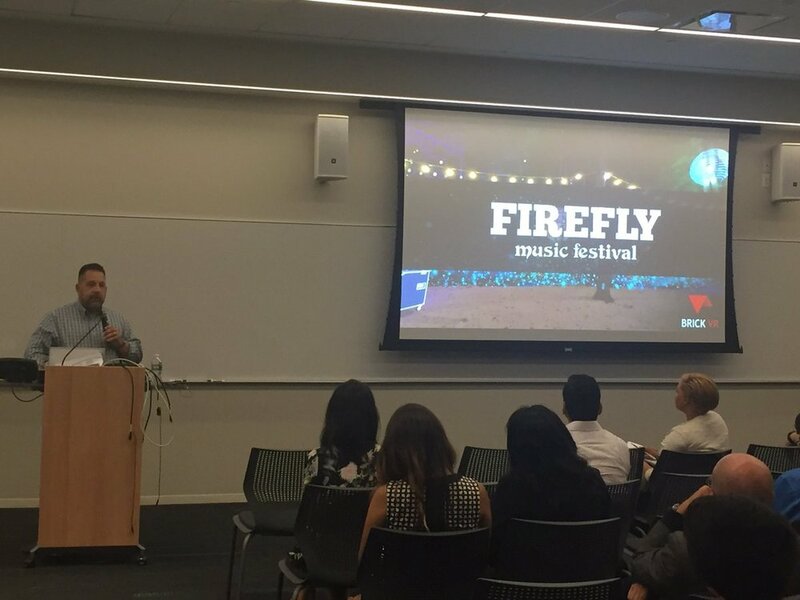 SpaceoutVR talked about music as one of their driving experiences, BrickVR showcased their Firefly Concert Series to bring out emotional engagement, and Firstborn Digital Studio displayed their talent for action packed media play for sports brands. They also discussed the evolution of an earned media channel through their work with Mt. Dew. Keeping in line with the theme shared by fellow speakers, KonceptVR told a story of how they partnered with space programs to create a ‘transformative’ connection with the viewer in their upper stratosphere space vision project. Likewise, abstract color images set the scene as VirtualizeVR, David Mullett, delivered his nuanced rhythmic presentation of a work titled ‘a flash of color,’ which was used to hypnotize the user. Studio Transcendent described the narrative journey, and Total Cinema 360, Director Adrian Vasquez de Velasco authentically expressed his passion for original creative content. The evening was wrapped up perfectly by TwoGoats Experiential Marketing Agency, Rich Cummings’, very accessible zeal while going over brand marketing and business in the VR space. All in all a great success! Look forward to more. 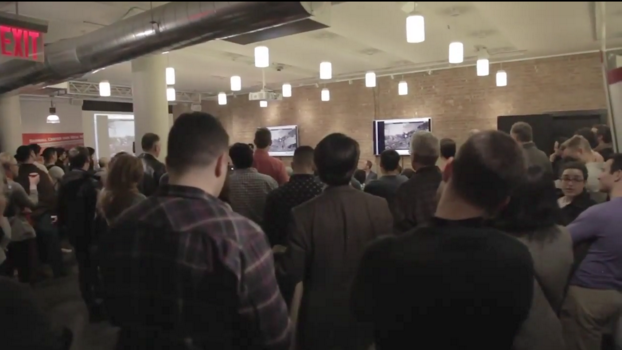 The VR/AR Association NYC Chapter Launch event was a huge success. Hosted at NYU, the event was sold out. The attendees represented a good mix of the NYC’s VR AR community, including Tech companies, Media and Entertainment, and Research. The event included demos, including the following. David Lobster from NYU’s Holojam VR team showed us the fascinating work NYU is doing with its own VR headset unit. Asher Weintraub, who is 12-year-old VR creator (Oculus VR), inspired everyone with his passion for VR AR and the work he’s doing. Dennis Adamo and Owen Bush form Daydream.io showed off their Daydream.VR, a music powered Virtual Reality, which enables anyone to create a fully immersive, sound-responsive, fantastical world from their music collection. There was a panel of experts, moderated by Chris Pfaff, CEO, Chris Pfaff Tech/Media. Chris is well known in the VR AR community and did a fine job with the following panelists: Marco Ricci, Director of Virtual Reality, EdgeDNA. Caitlin Burns, Chief Operating Officer, datavized. 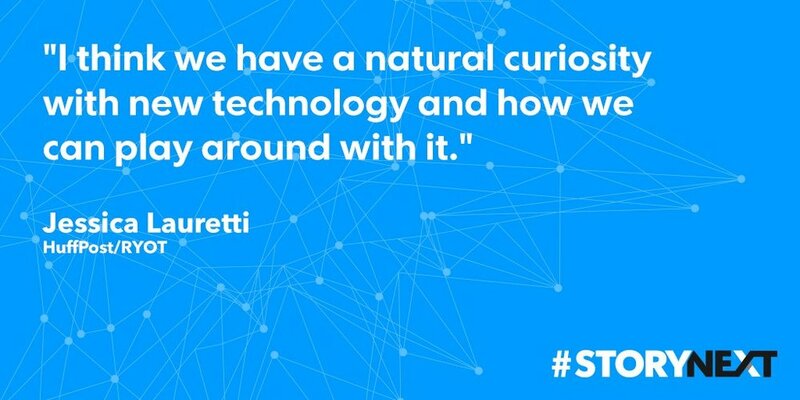 Ariel Shimoni, Director of Virtual Reality, StartApp. Brad Albert, Founder, Co-founder, Azimyth Studios, and, Miguel Sanchez, Founder of Massideation. The event concluded with a Startup VC Pitch segment of the program, which was another highlight of the evening. Two VCs, Shawn Cheng from Vayner Capital and Jonathan Struhl from Indicator Ventures, were the judges for the startups that were pitching. 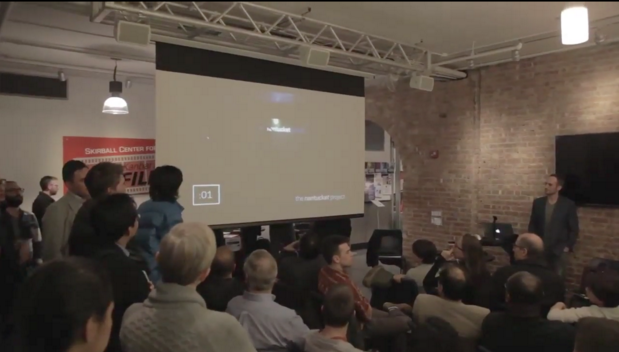 The audience at the event were also involved in voting the best startup. 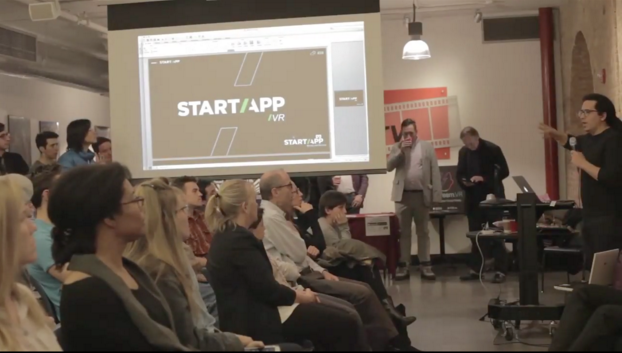 The Founder of the VR/AR Association, Nathan Pettyjohn, flew into NYC for the event. Below is a picture of Kris and Sarah, VR/AR NYC Chapter staff, with Nathan. And, other pictures from the event. Video of the event will be posted soon. Congratulations to AOL for putting such a great event together! 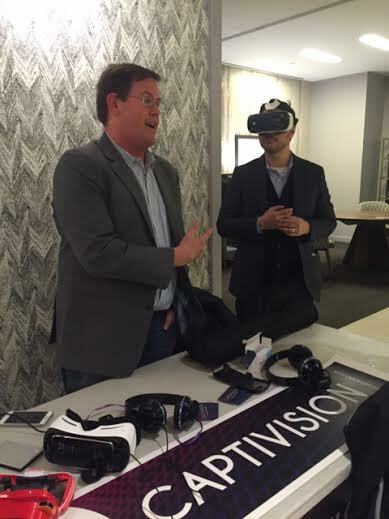 VRARA NYC staff Kris Kolo & Sarah Zhang attended the event, which was hosted at the AOL NYC headquarters. Experts in 360 Video, VR and Augmented Reality presented at the Future Possibilities of VR panel, which was moderated by AOL’s CTO Bill Pence. 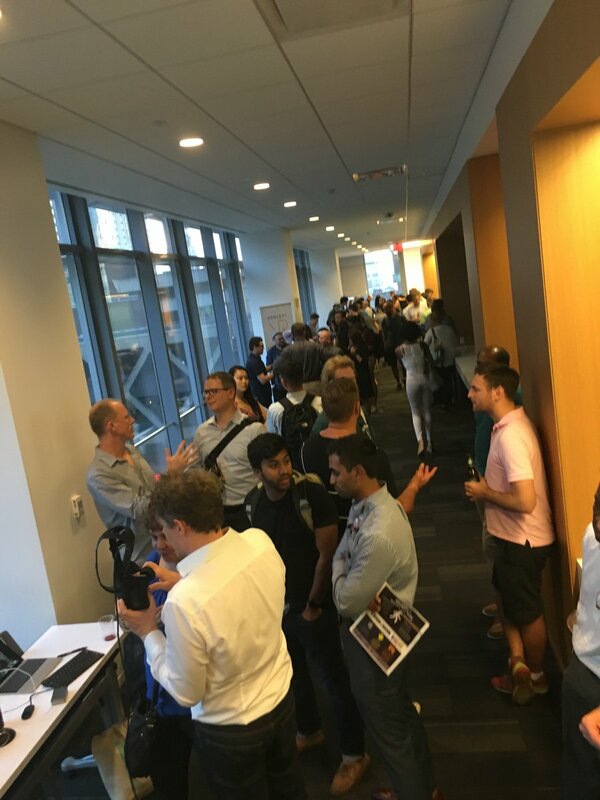 We also experienced VR tech at the demos fair featuring breakthrough NYC start-ups and industry leaders pre-selected by AOL to attend the event. NYC VR AR Startups at the event included: SurrealVR, IrisVR, VisiSonics, Floored, YouVisit, and others. Come to our next VR AR event on March 22nd! Register here. It was an awesome event at Microsoft NYC filled with demos and fun next-generation experiences. One demo that stood out was the VR Motion Simulator. Virtual reality has long been a dream of gamers everywhere. 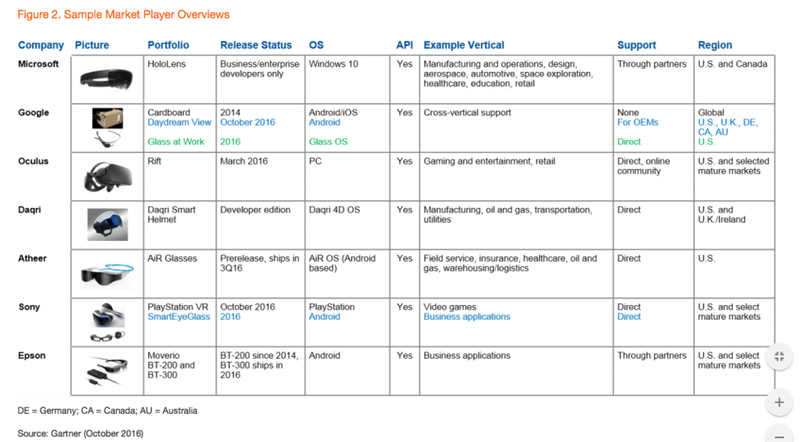 Given Microsoft’s interest in VR (i.e., HoloLens) and games (I.e. Xbox), the next big opportunity could be this motion simulator “unit” that I took for a test-drive, which combines motion with VR. Playing a car racing game, the unit gave me an immersive experience that I “felt” like never before; In addition to “seeing” the experience in VR, the unit also enabled me to “feel” every turn, spin, or accident with other cars by simulating the motion. The prototype cost is about $3500, pricy, but cost will come down with mass production of these units. Coming near you at your local amusement park, arcade room, or your future in-house set! I had the privilege and opportunity of being an advisor to FlyBy Media, which just got acquired by Apple. 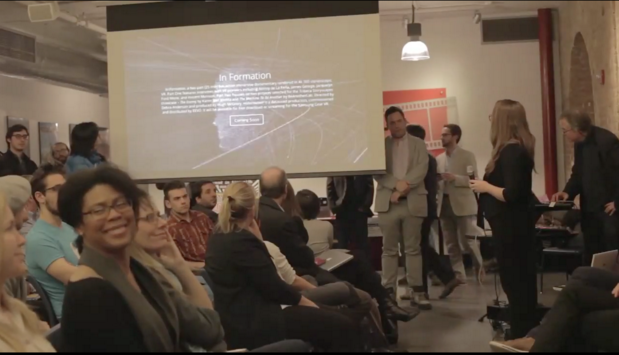 FlyBy Media’s mission was to create powerful new technologies to bridge the physical and digital worlds. FlyBy Media developed Shimmer, a VR app which uses the phone’s camera and FlyBy Media’s vision technology. When inside a store, shoppers aim their phone’s camera at a product to discover more information about the product.